Folding Tables store nicely on Table Storage Dollies and can be broken down easily. Volunteer work and presentations can often require Table Top Displays that will benefit from Collapsible Tables that are easy to move around! 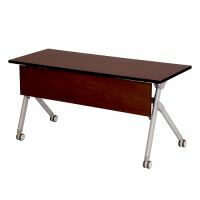 US Markerboard offers a selection of folding tables, from Aluminum Swirl Folding Tables to Round Folding Tables and Rectangular Folding Tables. Tables with Modesty Panels and Tables with Grommet Holes for wires make it easy to look professional and put together quickly. Grilling outside and throwing a cookout? Besides all of the Grilling Equipment you�ll need, your guests will be sitting comfortably around easy to set up Outdoor Folding Tables! See what a folding table can change a room into on an as needed basis and store them away when not in use!